Our thanks to AppsGoneFree for sponsoring our RSS feed this week. App discovery is a huge problem. With nearly 1 billion apps currently available on the App Store, even high quality apps go unnoticed. An app’s future too often relies on marketing tactics, existing brand, and really just a whole lot of luck. AppsGoneFree, an app that already has more than a million users, is threatening to completely overhaul this system, by using a viral approach to allow only the best apps to shine. Best of all, users will get to enjoy all these phenomenal apps for free. One of the “marketing tactics” that many developers try is, to reduce their price to free for a limited time. The goal is to create a buzz around the app. If it’s free there are less barriers to getting people to try it, and maybe a blog or two will cover the “sale”. The hope then becomes that the people who downloaded the app for free will start talking about the app, which will lead to more downloads, and eventually actual paid sales. The problem with this methodology is the App Store is too crazy a place for methodologies. There are literally several hundred apps reducing their price to free each day. Thus, this technique doesn’t work reliably to draw any attention to an app. The original iteration of AppsGoneFree, released over a year ago, took a first step at solving this problem. AppsGoneFree uses actual writers from the website AppAdvice.com. These app experts look through each free app every day, and then only list the ones worth downloading. Each day there are no more than a handful of results, with accompanying text on why the app is worth downloading. Launching next week is the 2.0 iteration of AppsGoneFree. Along with adding an iPad app, and now finding deals in 9 different languages and locations, there is a radical new feature called AppBump. According to the developers, AppBump will allow the vast AppsGoneFree community to band together to create the deals. It will allow users of the AppsGoneFree app to get much higher quality apps for free, and give deserving developers the recognition they have been struggling to find. AppsGoneFree has a community of more than a million members. So if any of these members find a paid app, that they think everyone would love, they simply go into AppsGoneFree and “Bump” that app. 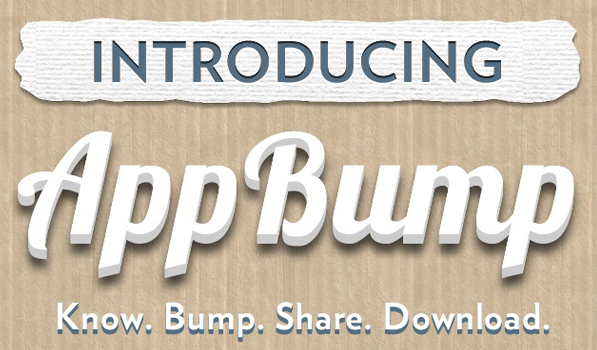 A bump is like a nomination, in which a user is vouching that the app is worth downloading on anyone’s device. When apps get enough bumps, the AppsGoneFree team is assured that the bumped app is of high quality, then can use that data to make the developer an interesting proposition. The folks at AppsGoneFree tell the developer that his/her app was nominated for the “AppBump”. If the developer agrees to make his app free for at least 1 day, AppsGoneFree will feature this app and denote it as a “bumped” app. The entire community knows this demarcation means it’s a great app and they are supposed to download and try the app right away. With more than a million people seeing this promotion, the developer finally has a way to stand out from the 700,000+ apps in the App Store. His app, while temporarily free, will soar up the charts, thanks to all the AppsGoneFree downloads. The developer will finally enjoy the recognition he deserves, while millions of people get a great app for free. The AppsGoneFree team reiterated that this is not another one of those “for-profit” deal apps. Developers cannot buy their way onto this list, the way they can in other deal apps. If a developer wants the recognition of being a bumped app, he has to get the bumps. The AppsGoneFree team believes this is the only way to get truly great apps to users, and reward apps for being great, not for being the highest bidder.